This weekend, the official trailer for the documentary Contemporary Color was released. 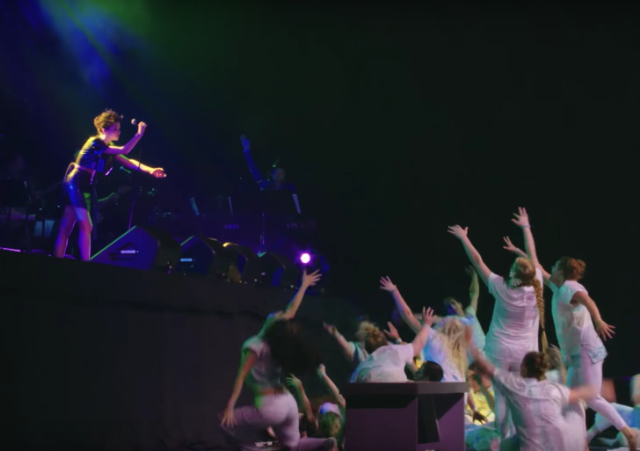 The film captures a stage performance of the same name that David Byrne organized with the Brooklyn Academy of Music and Toronto’s Luminato Festival in the summer of 2015. The production featured original music and performances from a group of musicians and artists including Byrne, St. Vincent, Devonté Hynes, tUnE-yArDs, Zola Jesus, Money Mark/Ad-Rock, Kelis, Lucius, Nelly Furtado, How to Dress Well, and Nico Muhly (in collaboration with Ira Glass). Also included are a series of 10 color guard performances from US and Canadian teams, featuring twirling flags, swords, and rifles. Last year, the film won awards for Best Documentary Cinematography and Best Documentary Editing at the Tribeca Film Festival. The documentary will play at theaters in a few major cities, beginning in NYC on March 1. You can also pre-order a digital copy of the film through the film’s website. Watch the preview and check out the announced screening dates below.